If this review seems a bit brief, there’s a reason. 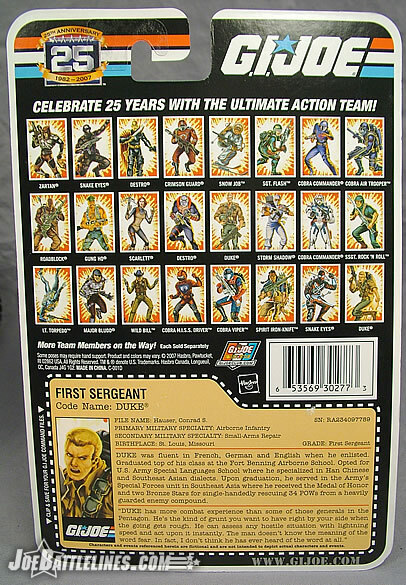 By some time next week I will have reviewed the 25A Duke action figure three times as Duke, and an additional time as General Hawk. 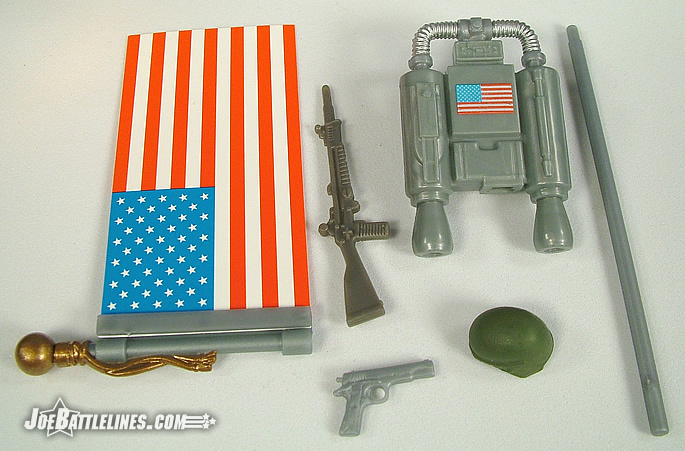 (I’m referring to the GIJoe Command three-pack that’s exclusive to retailer Toys R Us.) However, I have to give Hasbro props for taking what could have been “yet another” Duke repaint and turning him into something visually interesting. In fact, I might even go so far to say that I prefer this version of Duke over all of the others released thus far. So, I’m going to keep the introduction remarkably informal and remarkably brief and, instead of pontificating about the popularity of Duke in the fandom or with Hasbro marketing, I’m going to pass the key board over to Justin so that he can add this thoughts about this latest repaint of Duke. I have to agree on all counts. First of all, I too am sick of Duke, I’m VERY sick of those Duke arms, and I’m ready to move on to something different. But I also agree that Hasbro has done a good job so far making the figures at least a little bit different enough to work. Minor changes to the shirt and pants (not to mention the bandolier) gives us a brighter and almost more “celebratory” Duke that really seems to honor the character and the mythos. 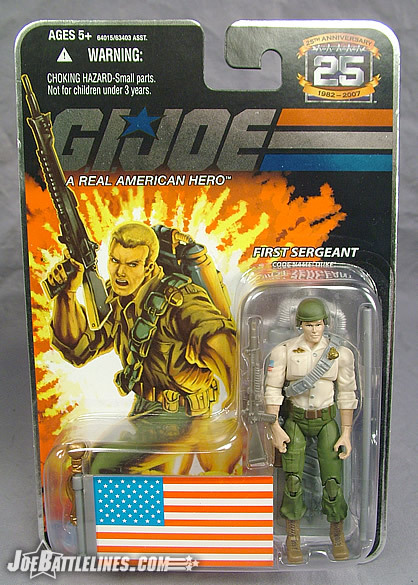 I’ll break this figure down succinctly—if you’ve purchased the initial GIJoe five pack, the Toys R Us GIJoe Command pack, or the 2007 wave 4 single carded figure of Duke, then you essentially already own this figure. The biggest changes to be found to this version from the previous releases are entirely cosmetic. Duke’s shirt is now off white, his bandoleer is now gray, his sleeve sports a backwards US flag patch, and his pants are a darker shade of olive. Many fans are already wondering why they should purchase this figure and something as simple as a color scheme change really isn’t much of a reason, is it? After all, doesn’t this figure still have the dreaded “Duke arms” that Justin and I have campaigned against like two Presidential candidates desperate to win the November election? The answer isn’t so cut and dried—at least to my eyes. I actually prefer this version of Duke over the other two released color schemes. Yes, I know that this isn’t the original color scheme and that Duke should be wearing a tan shirt, etc, etc. However, I don’t care as there is just something about the color combination of the uniform components of this figure that just comes together. (Think “the rug” from “The Big Lebowski”—it just really brought the whole room together.) For once, Duke’s classic uniform just doesn’t seem as bland as it once did. Perhaps it’s the contrast between the light colored shirt and the darker colored pants or the way that the gold Ranger wings now seem to jump off the figure’s chest—regardless, this design comes together in a way that I wouldn’t have thought possible. This is THE Duke of my meager 25A shelf and he will most likely remain that way for the foreseeable future. So Justin, am I just going off the deep end here? No, I don’t think so. I mean, let’s face it, this is just Duke. 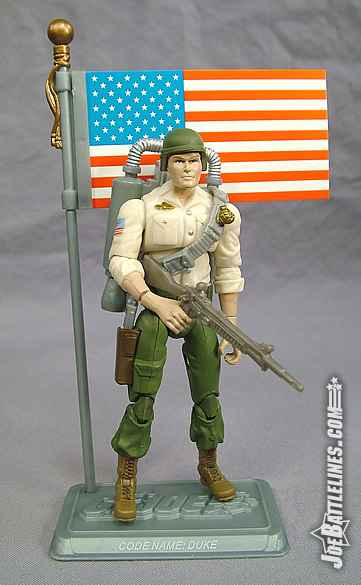 It’s another Duke, and as such, it’s tough to get excited about it, but the somewhat contrasted color scheme, the nice silver battle stand, rifle, and American Flag really makes this figure “jump” (no pun intended) and the jetpack only helps it more. I’m not sure I’d say this is the definitive Duke released of the 25 th Anniversary so far, but it’s a pretty nice update to Duke, especially considering it’s all reused parts and no clever “mixing and matching”. YEAH, I GOTTA-- HEY… DAMMIT, FRED. That’s better. I can’t get quite as excited about Duke as Fred has, just because those arms really drag me down and even with these nicer colors and the jetpack, this is a figure that’s tough to get fired up over. In fact, I’d almost say that this Duke sort of exemplifies everything about Wave 3, 2008. I think I can say, now that I stand back and look at this wave as a whole, that overall the wave seems solid, but unexciting. Some great updated characters, some nice new tooling, but in the end, a few glaring flaws, a bunch of nagging issues, and an overall wave that leaves me surprisingly underwhelmed, considering how excited I was to get it originally. That’s not to say the wave is a failure or that I don’t like it, it just didn’t meet my high expectations. 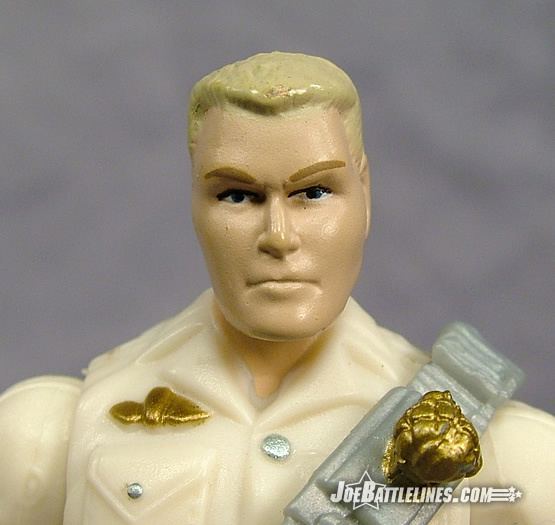 From Viper’s hands to Wild Bill’s head to Duke’s arms, and Spirit’s head sculpt there are just a number of minor flaws that pull the wave down a bit from what “could have been”. Still, there is some nice new tooling involved, and the future looks extremely bright from the looks of Wave 5. I’ve got my hopes up as we go forward, I just found myself a tad disappointed overall with this wave. I’ll admit it—I’m shocked by how much I like this particular figure. In spite of being one of the worst articulated figures in this line, I can’t help but like this version of Duke. This is the figure that I could have displayed on my desk at work and folks wouldn’t wonder whose kid left his toys on my desk. 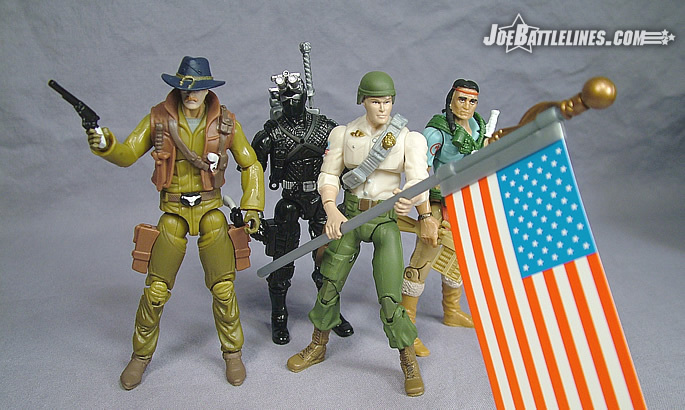 This is the figure that takes me back in time to simpler time when the lines were clearly drawn and the United States military stood as proudly as the line of defense against the “Iron Curtain”. The folks in Pawtucket managed, by the addition of a few simple accessories and a quick color change, to take one of my least favorite figures in this entire anniversary line and turn him into the one figure that I’ll proudly display for Joe fans and non-Joe fans alike. I can’t really explain it but this just might be my favorite figure of this entire wave. Consider him highly recommended! Well, I pretty much gave my closing comments in the paragraph above. 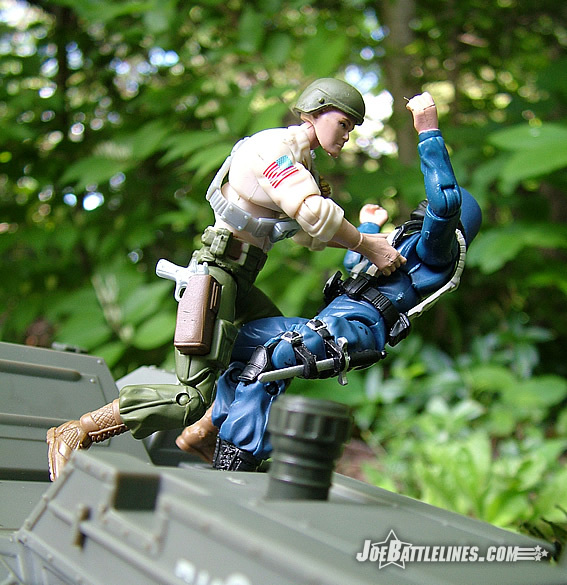 Duke is fine, and overall kind of exemplifies what the overall issues are with this entire wave of Anniversary figures. It’s not bad, not terrific, but I think it’s laying a pretty great foundation for some potentially terrific offerings still to come.